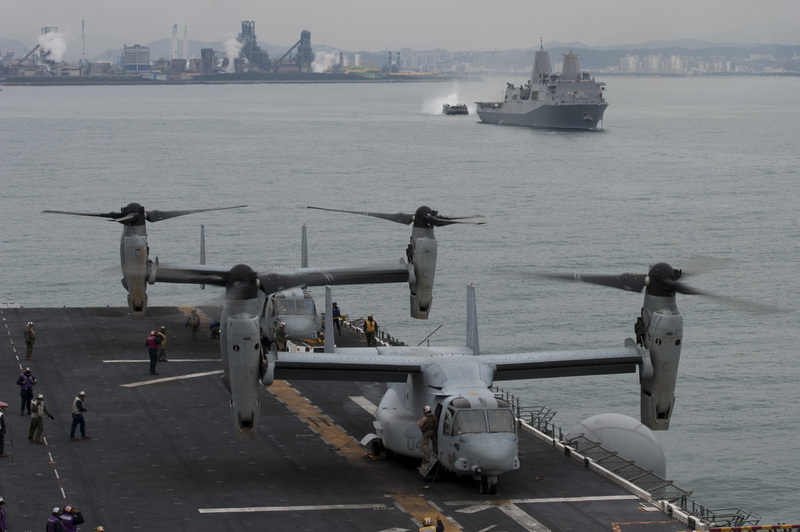 MV-22 Osprey tilt rotor aircraft prepare to take off from the flight deck of the amphibious assault ship USS Bonhomme Richard (LHD 6), while in the background an landing craft air cushion (LCAC) approaches the amphibious transport dock ship USS Green Bay (LPD 20) in April 2015. US Navy photo. The surface and expeditionary warfare community has adopted the aviation community’s “enterprise” approach to coordinating modernization and maintenance throughout the fleet, in an attempt to regain ship readiness that has declined since the 1990s, the director of expeditionary warfare (OPNAV N95) said last week. Maj. Gen. Christopher Owens said March 31 at a Center for Strategic and International Studies event that not having enough amphibious ships to meet the Marines’ needs has led to a cycle of extended deployments, extended maintenance periods to make up for running the ship too hard, and then a rush to train because maintenance ran long. “Often times the commanders are forced to make the decision, do we incorporate the remaining essential upgrades, do we defer maintenance, or do we cut into training, or do we do a little of both?” he said. Ultimately, he said, this puts at risk a ship’s ability to reach the end of its expected service life. To that end, the Navy and Marine Corps launched a surface and expeditionary warfare enterprise effort to bring together the operational, acquisition and resource sponsor leaders that touch these ships and can help improve readiness through coordinated decisions. 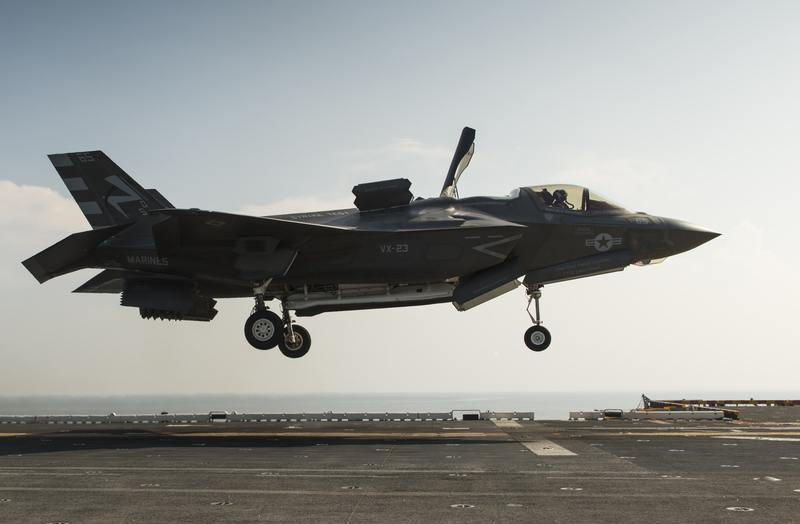 “What it does, it allows us to prioritize the maintenance and modernization requirements, to predict the requirements of these ships so we can do better planning for maintenance, and to find some cross-class solutions, something that works on one class of ships that would also work on another class of ships, to both save us money and to head off problems before they arise,” Owens said. The Navy created an Optimized Fleet Response Plan to balance the training, maintenance and operational needs of individual ships in the fleet, and Owens said this enterprise effort works nicely with OFRP on a fleet-wide level. “The enterprise supports that Optimized Fleet Response Plan because it allows us to do the planning farther out ahead of time, and when we plan our major maintenance availabilities or maintenance periods in the yards farther out we can ensure that the necessary maintenance gets prioritized,” he explained. “And then, because the enterprise has come together and developed a prioritized list, we know, given the amount of time we have, we have the things that must be done and then the things that should be done, and we’re able to better draw that line – and if it can’t be done during this availability, then we look at the next one. And as things are done, other things move up the prioritization list. “It sounds very basic, but we haven’t been doing it in that logical a manner over these past several years when the schedules have been so tight,” Owens said. Commander of Naval Surface Forces Vice Adm. Tom Rowden is the head of the surface and expeditionary warfare enterprise, with other stakeholders joining him last month for a summit in San Diego to understand how the enterprise process would work and what requirements the fleet is currently facing. Also during his speech, Owens discussed the upcoming LX(R) dock landing ship replacement program, which will be based off the San Antonio-class dock landing ship (LPD-17) design still in production at Ingalls Shipbuilding. Owens said the Navy and Marine Corps first considered building a ship similar to the LSDs set to retire beginning in the 2020s, but the yards that built those ships are all closed and the effort would have required a clean-sheet design to replicate the LSDs. Instead, the services decided they could get a more capable ship for less money if they took the LPD design and scaled it down. Owens said the LX(R) effort will be guided by commonality, cost cap and competition considerations. The Navy and Marines have developed a prioritized list of features they could cut if the ships start to come in over budget, and features they could add in if the ships come in under the cost cap, to ensure the services get the very most capability possible for the available funds. The first LX(R) is set to deliver in 2025, ahead of the 2027 retirement of the first LSD. The increase in capability in the ship will help forward-deployed Marines, who are increasingly operating the three-ship Amphibious Ready Groups in split and disaggregated formations to cover more ground with a single ARG. While the current LSD does not have sufficient capability to operate independently, the LPD does – and the LX(R) will as well, with the LPD’s advanced communications gear, medical equipment, aviation capability and more – and the future ARG will therefore give combatant commanders more options for how to employ the three-ship groups. Owens said that one effect of not having enough ships in the fleet recently has been the cessation of single-ship deployments or exercises – which has also meant that Marines don’t see the inside of a ship until pre-deployment workups. “What that means is that when it does come time to get together, it takes that much longer to learn how do I get my gear on the ship? How do I take care of my gear on the ship? How do I get it off the ship? And how do I make that transition mentally and physically” to life at sea, he said. Owens said the Marines have resorted to going onto ships in port for maintenance to get an early look at the spaces they’ll have to work with during a deployment, since ships have not been available for familiarization training ahead of workups.